Japanese brand Sharp has been releasing bezel-less handsets since 2014, and now the new Aquos S2 is available in China as promised. The price of this Qualcomm Snapdragon 630-powered phone is around US$370. 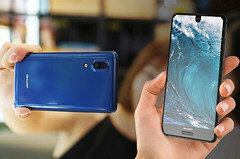 Back in 2014, Sharp released the bezel-less Aquos Crystal way before the major brands in the industry started to take into account this design approach. Now, the Aquos Crystal 2 is already available and seems to look like a mix between Andy Rubin's Essential Phone and the Apple iPhone 8, both still not available on the market. The Sharp Aquos S2 is a premium mid-range handset with a 5.5-inch full HD display that fits nicely in a 4.9-inch form factor. It uses a Qualcomm Snapdragon 630 processor, next to 4 GB RAM, 64 GB internal storage, a dual-camera setup on the back (12 MP + 8 MP), as well as a selfie shooter with an 8 MP sensor and f/2.0 aperture. China is the first market to receive the Sharp Aquos S2 and, for now, we have no information about its arrival in other countries. Its price tag is around US$370. The larger, Qualcomm Snapdragon 660-powered Aquos S2 Plus is expected to launch at a later date for a price of around US$520.